If you downloaded the update for this mod released on 11/13, it WILL throw exception errors in your game. The mod has been updated to fix this. Updated (11/17/2018) - Bugfix for 11/13 update -- The mod has been updated for the latest game version 1.47.49 (Nov 13, 2018). All three of the mod strengths are now contained in the download file. Unzip only the ts4script file you need to your mods folder. You can switch to a different strength version any time you wish, just be sure to remove the old one. The method used to override the game defaults internally has changed to be hopefully a bit more future proof and safer. Rather than completely replacing a portion of the game script, it is allowed to run normally to build the relationships and then the mod takes over and tweaks them. As the game no longer supports non-reciprocal relationships, the mod will not be able to generate relationships where, e.g. the husband hates his wife, but she adores him. The method of generating the relationship variances from the default has been tweaked to be a smoother (fewer 100 and -100 level relationships). As always, existing household relationships will not be changed by the mod. Only new CAS created families/households, newborns, and new townie families will be varied. Everybody in a new household gets along by default. HOW UTTERLY BORING! Want a change? Want a challenge? 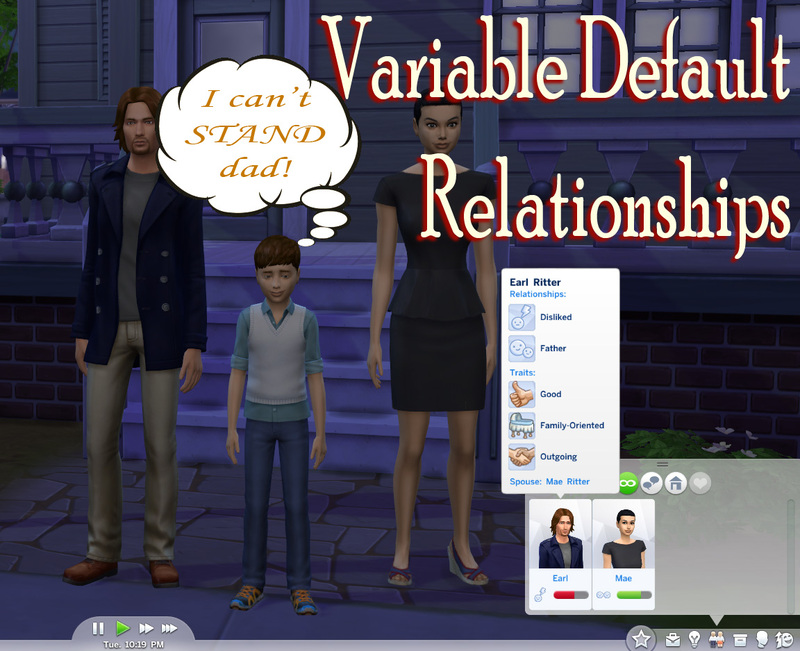 With variable default relationships, your next household might be completely disfunctional! This Mod will vary the starting sim relationships when a new household is created. The relationships can range anywhere from outright hatred to the very best of friends. Both friendship and romance relationships vary. A married sim's love may not be reciprocated, or perhaps both partners hate each other and it's purely physical, or they could be great friends but the romance has gone stale! The variance is not purely random. For those who know about probability, the resulting relationshps are based on a gaussian distribution centered on the default relationship values. Since the results are based on statistical averages, even the lowest strength can on occasion create sims that utterly despise each other. It will be rare, but it is possible. BTW: I generated a lot of families during testing to tweak the results, but I am interested in any opinions as far as the tuning of the variances. Too much? Too little? Let me know! This mod also affects newly generated "townie" sims households. Relationships in existing households will not be changed. Unzip the desired strength version of the script, a .ts4script file, from the zip file into your game Mods folder. This is a script mod, so scripting must be enabled in your game options. Use only one of the available strengths. 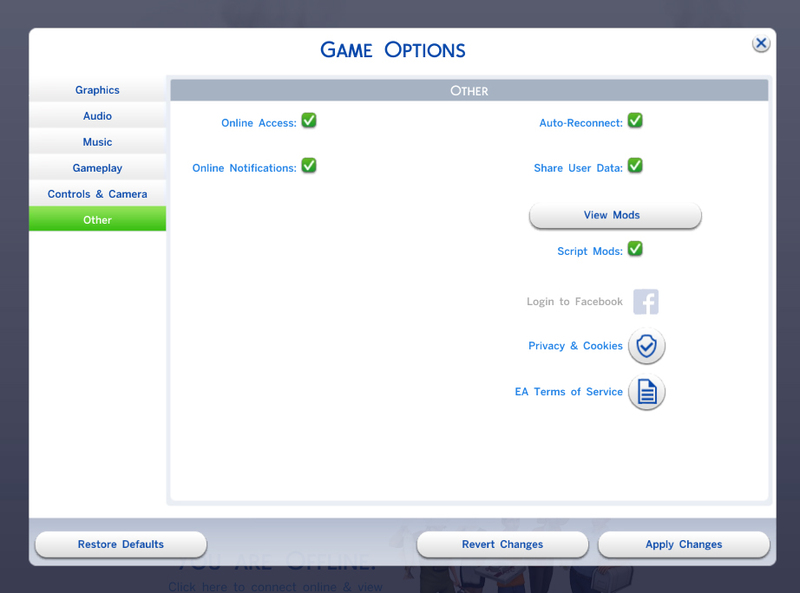 You can change your choice at any time by replacing the .ts4script file in your Mods folder with one of the other strengths. This mod should be compatible with any version of the game since 1.47.49 (November 13, 2018). The script source is included in the zip file and the changes are well commented in case someone wants to use it within a story progression type mod. If you do this, I do expect to be credited! The script honors the relationship track tuning and uses the values as the mean for the random distribution for the relationship of sim "A" to sim "B"
The default romance track tuning value for a married couple is 75. These are defined in the tunings from S4_03B33DDF_00000000_055665688DE6D37C. The distance to the furthest extent from 75 (-100) is 175. The default strength would define a standard deviation of 175 / 5, or 35. For the relationship of SimA -> SimB, a gaussian distribution random number is generated with 75 for the mean and 35 for the sigma. For this example, it might come out as 27. (The relationship of SimB -> SimA is now restricted to be the same as SimA -> SimB) The value 27 is then used as the mean for the relationship of SimB -> SimA. The standard deviation the second time would be 127 / 5, or 25. Install only ONE of the strengths below. See the mod description for more information. If you change strengths, be sure to remove the old version!